As advanced as the Model J Duesenberg was upon its introduction in 1929, most of the technical advancements contained within were confined to the body and chassis. The design of the front end and fenders, as well as that of most coachbuilt bodies, still bowed toward late-1920s convention, albeit stylishly. 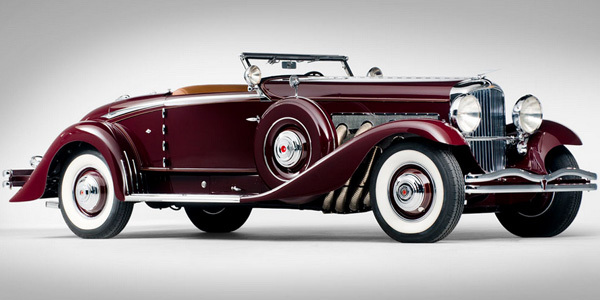 As a result, by the mid-1930s, the Duesenberg still held mechanical prowess over virtually everything else on the road. From a design standpoint, however, it was looking rather dated. J. Herbert Newport, who had succeeded Gordon Buehrig as Duesenberg’s body designer, set out to do something about that. Among his creations for the Model J was a new convertible coupe, which incorporated the best of the Duesenberg’s trademark styling cues with the curves of modern streamlining. The traditional upright radiator shell and headlights were now accompanied by deeply skirted and rounded fenders, designed by Alex Tremulis and added at the factory branch, over 17-inch wheels. The beltline began as a slender molding running alongside the hood, and as it reached the windshield, it expanded out along the sides of the body into a polished “sweep,” which then fell back along the long fender like a trailing comet. The design’s most innovative feature, however, was its convertible top. Most ragtops of the period were clumsy and challenging, requiring a small gang to operate properly. Newport’s convertible coupe incorporated a “semi-automatic” top, based on one previously created for a Rollston-bodied Duesenberg convertible victoria. The owner would unbuckle the top from the windshield frame, and then slip a hand crank into a chromed socket on the side of the body. With a few turns of the crank, the top would fold to the rear of the car and out of sight under its flush-fitting metal lid, producing an open two-passenger car whose lithe, flowing lines made it the Duesenberg equivalent of the Mercedes Special Roadsters of the era. Production of this body style was handled by the A.H. Walker Body Company, of Indianapolis, one of several firms that produced bodies for Duesenberg under the classy pseudonym of “LaGrande.” With Duesenberg’s days waning and the Great Depression still largely at its zenith, Walker built only a mere three examples of the Newport-designed convertible coupe. Of the three cars, 2563/J-530 was the only example built with a factory-supercharged engine—the powerplant today famously referred to by enthusiasts as “SJ.” The engine bore a centrifugal supercharger, which was constantly engaged, and produced whizz that is music to the ear of the Duesenberg enthusiast, as well as an additional 60 horsepower. That made the final brake horsepower rating of an SJ Duesenberg something near 320 horsepower, allowing it to get ever-closer to a top speed of 140 miles per hour, over 20 miles an hour faster than a naturally-aspirated example. 320 bhp, 420 cu. in. DOHC inline eight-cylinder engine with centrifugal supercharger, three-speed manual transmission, beam type front and live rear axles with semi-elliptic leaf springs, and vacuum-assisted four-wheel hydraulic drum brakes. Wheelbase: 142.5 in.